There are probably over 300 tunes in the piobaireachd repertoire. 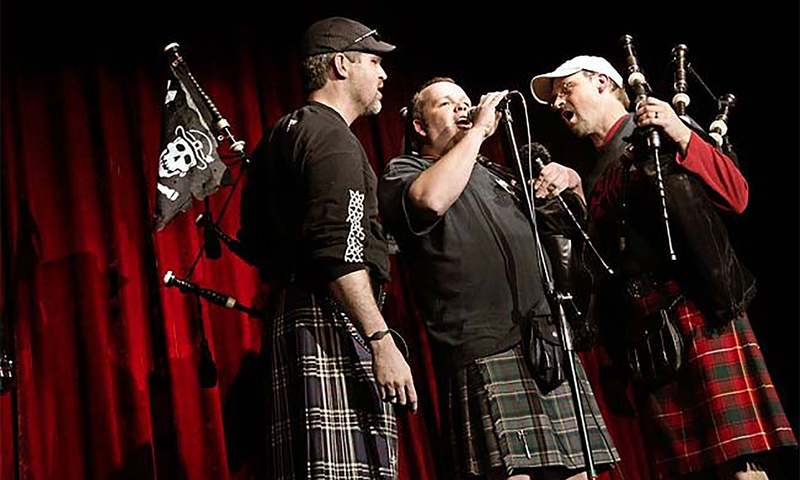 Many of these tunes originate with the MacCrimmon family on the Isle of Skye and piping families like them during the 17th and 18th centuries. The names and histories of the tunes reflect life in those times: many of the tunes are laments, commemorating a person or event; some are salutes, others are gathering tunes. There are tunes with arcane, cryptic names, like â€œThe Fingerlockâ€, â€œThe Groatâ€, â€œThe Red Speckled Bullâ€, â€œToo Long in This Conditionâ€ and â€œScarce of Fishingâ€. There are tunes with beautifully descriptive names, such as â€œMy Dearest on Earth, Give Me Your Kissâ€ and â€œThe Sound of the Waves Against the Castle at Duntroonâ€. Lest the names sound a little fanciful, I should add a caveat here: During the course of the 19th century, as military marches and like tunes became the staple of pipers, piobaireachd was played by fewer people. This, combined with the Victoriansâ€™ predilection for romanticizing the cultures they were assimilating, resulted in a number of tunes gaining suspiciously elaborate provenances. Despite this, a significant number of tunes have no name – oral transmission being what it is, the tunes remain â€œNamelessâ€, unless researchers can dig up new manuscripts. The effect of this was certainly to preserve piobaireachd as a music, but also to codify its execution under the control of a handful of arbiters, often not the pre-eminent pipers of the day. Despite this, 100 years later, interest in piobaireachd is probably as widespread as it has ever been, and (due in large part to hard work on the part of the Piobaireachd Society) more manuscripts and sources are available to the interested piper than ever. For better or worse the influence of the Piobaireachd Society on the music is strong and, as long as that influence is correctly understood, it is probably more benign than harmful in the long run. So now you’re totally intrigued, and want to listen to some of these great tunes. How can you do that? I’m not sure if Archibald Campbell of Kilberry was one of the founding members of the Society or its first president. I’ve been looking at the Society page and am not able to tell due to lack of information or a “History” page. In any event, Archibald Campbell did end up editing a large portion of the Piobaireachd Society manuscripts and some of the more up to date contain his in addition to other sources. General C.S. Thomason was the first President of the Piobaireachd Society. I, too, have been unable to clarify exactly what role Archibald Campbell (and J.P. Grant of Rothiemurchus) played in the very early days of the society. I’ll keep on it! I do know that Thomason was sidelined fairly early on after some kind of power struggle, and that Campbell went on to exert a major influence on the music thereafter. This has historically been a source of criticism of the Society, although it does not seem clear to me that lasting damage has been done. Just to clarify my above comment, General Thomason was a founder of the Piobaireachd Society in 1903. By this time he had already produced his piobaireachd collection “Ceol Mor”. It is likely this would have become the pre-eminent collection of piobaireachd, but his ejection from the Society the following year by Kilberry and others brought Campbell’s own collection into the forefront. Campbell apparently took a dim view of Thomason’s work and took every opportunity to belittle it. This animosity has been cast as class-motivated, but I have to admit my only sources for the accounts of this are the writings of Dr. William Donaldson on the Pipes|Drums website, whose position may also be subjective. As far as I am able to ascertain, the Piobaireachd Society no longer has any opposition to the use of the Thomason collection; to the contrary, it is now in the business of promoting the use of as many sources as possible. By the way, an excellent (and inexpensive) source for some of these manuscripts is the company Ceol Sean. They have many old (and important) collections of both piobaireachd and light music on CD-ROM.